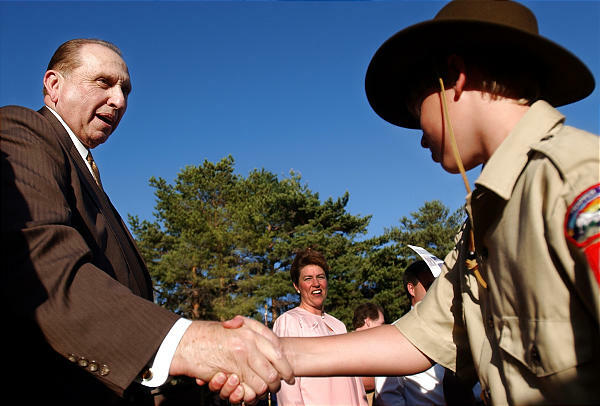 Former Church president Thomas S. Monson held three top Scouting awards: The Silver Beaver Award, the Silver Buffalo Award, and the Bronze Wolf Award. The Scouting program was adopted by The Church of Jesus Christ of Latter-day Saints as a part of the activity program for the young men in May of 1913. Prior to this time, the young men participated in The Young Men’s Mutual Improvement Association (YMMIA). The spiritual and cultural aspects of Scouting appealed to Church leaders and in 1911, the leaders of the YMMIA, looked into Scouting as a possible activity for the young men. Currently the Church sponsors more Scouts and Scouting units than any other organization in the United States. The program has also been expanded to include boys in the Primary beginning at age eight. The Scouting program provides boys and young men with a place to practice gospel lessons and learn desirable character traits, citizenship, as well as physical and mental fitness. The Church had also formed strong ties with scouting programs outside of the U.S., especially in Canada, Australia, New Zealand, Great Britain and others in Europe, Asia, South America and Africa. However, the largest number of Scouting programs are in the U.S. and Canada. For years, Church leaders have been preparing a new initiative to teach and provide leadership and development opportunities to all children and youth, to support families and to strengthen youth everywhere as they develop faith in the Lord and Savior, Jesus Christ. This new approach is intended to help all girls and boys, young women and young men discover their eternal identity, build character and resilience, develop life skills and fulfill their divine roles as daughters and sons of God. The initiative is designed to allow local leaders, families and even the young people themselves to customize their efforts, while providing service opportunities and activities, fostering healthy relationships and supporting communities. The new Church program will begin January 2020. The Church also issued a statement regarding the benefits of the Scouting program: "The Church honors Scouting organizations for their continued goal to develop character and instill values in youth. The lives of hundreds of thousands of young men, along with their families and communities, have been blessed by Scouting organizations worldwide." Since 1913 the Mormon Church has used the Scouting program as an integral part of its ministry to boys and young men. This unique relationship has been possible because of a close alignment of the goals and objectives between Scouting and the Church: namely, character building, citizenship training, personal fitness, and spiritual growth. We must pay a great tribute to those early Church leaders who in their great wisdom saw methods in the Scouting programs which, when properly applied, would bring youth into a closer and more meaningful relationship with their God and their fellowmen. The methods of Scouting provide a most effective means whereby boys can learn self-reliance, teamwork, duty to God and country, and respect for the beliefs and convictions of others—all by subscribing to the Scout Oath and Law and supporting it. In this way they develop a code of ethics and a sense of values by which they pattern their lives (Arch Monson, “Presentation of Scouting Award,” Ensign, May 1977, 35). This page was last edited on 16 October 2018, at 12:07.